Dessert is a special treat in our house. Anything more than fruit happens only once or twice a month, and although I have a mega sweet tooth, I prefer it this way. Not only does my son not take sweet treats for granted, but those occasional moments spent lingering at the dinner table while we enjoy a homemade dessert are even more special. Parfaits are a favorite dessert – they are extremely customizable and they are the perfect-sized ending to a good meal. My family loves the classic combination of chocolate pudding and whipped cream, but this simple custard recipe is making its way into our regular rotation. Custard used to sound daunting to me, but it is surprisingly easy, with the bulk of the difficulty connected to your attention in the kitchen. It comes together quickly, and if you get any overcooked bits of custard, don’t fret – you can press them through a sieve and blend it into the finished custard. 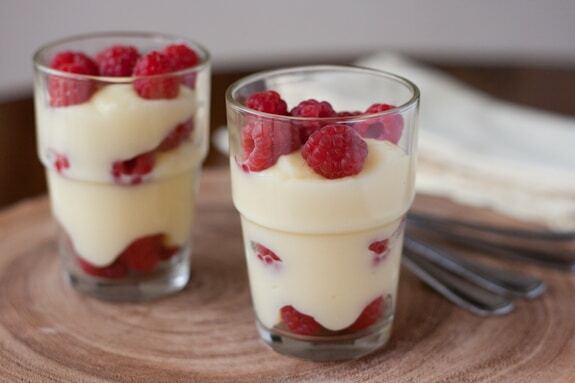 This custard was born out of my obsession with raspberries. Ginger and raspberry might be an unexpected combination, but the tart-sweet berries play off wonderfully with the heat of the ginger. You can use more ginger or let it steep longer in the milk (after removing it from the heat) if you want extra zing, but for a crowd-friendly dish I’ve found this amount is perfect. If you are unfamiliar with working with the knobby ginger, note that it is most easily peeled by scraping with the edge of a spoon. The peel should come off easily, and you won’t waste as much ginger flesh as you would with a traditional peeler or a knife. Tangy berries and zingy ginger play off each other in this simple, yet beautiful dessert. In a medium saucepan, heat milk and ginger just until bubbles begin to form at the edges. Meanwhile, whisk together eggs, cornstarch, sugar, and salt. Set over a bowl filled with ice cubes. Slowly pour the heated milk into the eggs, whisking the entire time. Pour the mixture back into the saucepan and heat over medium-low, stirring constantly, until mixture has thickened (about 5 minutes). Strain custard through a fine mesh sieve into a bowl; remove ginger. Cover custard with plastic wrap, pressing down onto the surface to prevent a skin from forming, and chill for 2 hours. Alternately, you can serve the custard warm. 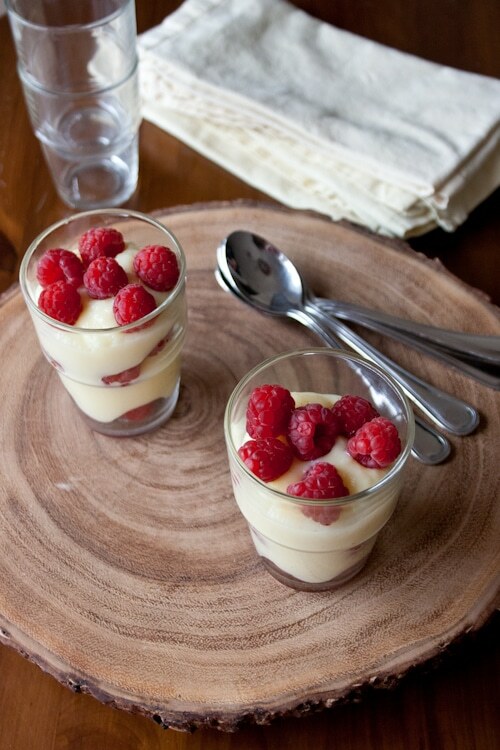 To serve, layer custard and raspberries in 6 small glasses or mason jars. What’s your favorite quick dessert? This dessert looks lovely. I look forward to raspberry season so I can try it out. Parfaits are such a wonderful sweet that isn’t bad for you! I love raspberries and once I can get them in season near me I am definitely trying this. This recipe also seems easy to follow which is great! This is perfect!!! We have “gluten free” friends visiting from Canada and they are going to love this!!! This looks so yummy! Do you know if you can make custard with a milk substitute? I’ve never tried using a milk substitute, however a quick search online shows many recipes for dairy-free custards. Good luck! Try coconut milk in place of the whole milk. It works better than almond milk and soy milk because it is so creamy! your recipe sounds really yummy, interesting and healthy……rasberries are not in season here in Malta. Strawberries have just started…..can I do it with strawberries or would the combination with the ginger clash?? I haven’t tried it yet?? What do you suggest before I try it out?? I made this yesterday and not only was it insanely easy to make but it went over beautifully with my guests! This was my first time making custard and I will absolutely make this again. Thanks for sharing! Can you prep the parfaits a few hours ahead with good results?